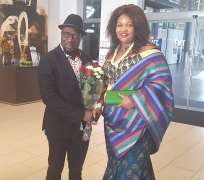 The umbrella body of all Nigerian Associations, Unions and Organizations in The Netherlands, The Nigerian National Association-The Netherlands (NNA-NL), under the leadership of Chief Evelyn Azih welcomes the new Nigeria Ambassador to The Royal Kingdom of Netherlands, His Excellency, Ambassador Ngofa. The arrival of the Ambassador today is a welcome development and a turnaround in the lives of Nigerians residing in The Netherlands who have stayed for a long time without an Ambassador. His first move of identifying the problem and trying to bring peace and harmony amongst Nigerians even before assuming office is a clear sign that he is not only a father, but a good Administrator who has demonstrated that he is a problem solver and the type of leader that Nigeria needs. Recognizing NNA-NL and appreciating the importance of working and reaching out to Nigerians residing in The Netherlands makes him our anchor in the Dutch Society. The former Ambassador, Her Excellency, Ambassador Akanbi who is one of the founders of NNA-NL did a lot of good jobs before leaving, but we are very optimistic that the new Ambassador, His Excellency, Ambassador Ngofa with his wealth of experience, intelligence and great knowledge, will do more to better the lives of Nigerians residing in The Netherlands. NNA-NL is particularly pleased to have been given the opportunity to welcome the new Ambassador and pray for a more united and progressive Nigerian Community in The Netherlands. Nigerian National Association-The Netherlands (NNA-NL), Uniting for the Integration and Development of Nigerians in The Netherlands. Long Live The Nigerian National Association-The Netherlands (NNA-NL), Long Live The Federal Republic of Nigeria.